This long-established name is of Anglo-Saxon origin, and is a locational surname deriving from any one of the places called Harrington: in Cumberland, near Whitehaven; in Lincolnshire, near Spilsby; and in Northamptonshire, near Kettering. The place in Cumberland, recorded circa 1160 as "Halfringtuna, Haverinton", is so called from the Olde English pre 7th Century byname "Haefer", from "haefer", he-goat, with the suffix -ing(as)", denoting people, tribe of, and "tun", settlement, enclosure. Harrington in Lincolnshire is recorded as "Harinton" in 1202, and is named with the Olde English "haer", stony ground, with "tun", as before, while the Northamptonshire Harrington, recorded as "Arintone" in the Domesday Book of 1086, and as "Hetherington" circa 1100, is so called from a derivative of the Olde English "haeth", heath; hence, "the settlement of the dwellers on a heath". 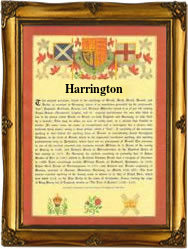 Harrington may also be an Irish name; it is widespread in Counties Cork and Kerry, where it may be either an Anglicized form of the Gaelic "O' hArrachtain", descendant of "Arrachtan", a personal name from "arrachtach", mighty, powerful, or an English import from the Plantations of the 17th Century. One Elias Harrington was an early emigrant to the American Colonies, leaving London in July 1635 on the "Assurance", bound for Virginia. A Coat of Arms granted to a family of the name depicts a red chevron between three black leopards' faces on a silver shield. The first recorded spelling of the family name is shown to be that of William de Harinton', which was dated 1202, witness in the "Assize Court Rolls of Lincolnshire", during the reign of King John, known as "Lackland", 1199 - 1216. Surnames became necessary when governments introduced personal taxation. In England this was known as Poll Tax. Throughout the centuries, surnames in every country have continued to "develop" often leading to astonishing variants of the original spelling.